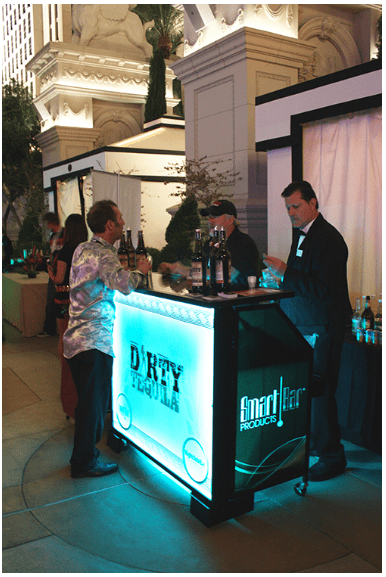 SmartBar Products was established in 2008 and are the developers and producer of the SmartBar, one of the most unique, innovative, successful portable bars in the industry today. Our factory is located in Mount Vernon, New York. We’re constantly developing new products and most recently, The Smart BackBar PLUS. SmartBar Products provide unique benefits and features including portability, LED lighting, and revenue generating with a guaranteed return on investment. SmartBar Products is proud to include some of the world’s largest and best-known organizations and corporations among its valued clients. We have the pleasure of working with Marriott International, Hilton Worldwide, Starwood Hotels & Resorts, Westin, Intercontinental Hotels Group, BSI Conferences, Questex Media Hospitality Group, Major League Baseball, Absolut, Diageo, Beam Global Wine & Spirits, Remy Cointreau, Monin, Moet Hennessy, Skyy, Hard Rock Cafe, and many many more! At SmartBar Products our goal is to work together with our customers to design and manufacture innovative furniture that is attractive, functional, and provides unique benefits. We understand and appreciate the challenges facing the Hospitality Industry and will dedicate ourselves to helping the industry to meet these challenges through furniture that not only solves problems but also increases sales and generates incremental profits. Portability – Each SmartBar Product offers the maximum in portability, rolling effortlessly by one person with easy and almost instant set up and tear down. Space Efficiency – Every SmartBar Product folds closed to less than 12″ inches taking up a minimum of valuable storage space. Functionality – Designed by hospitality engineers in conjunction with food and beverage managers, all Smart Bar products offer first quality materials and hardware. Our bars are designed with professional bartenders in mind. Our tables, sinks, buffets and other equipment are built to precision standards that mean longevity and permanence. Environment Effects – Here is where the “SmartBar experience” comes to life. Programmable, multi-color, remote-controlled lighting and digital effects, plus interchangeable, customizable graphics panels provide caterers and patrons with the unique ability to create a mood and an ambiance for any event. Return on Investment – Part of any good experience is the ability to improve the bottom line. Customizable panels and Smart Bar’s graphics services enable you to sell your clients’ personalized advertising and promotional messages, logos, trademarks, advertising slogans and full-color photographs. A feature that helps you generate incremental profits and a continuing return on investment.